From the wallpaper or border to be reconstructed an exact technical drawing for each colour to be printed is made, which takes into account the print-block starting points and the invisible lapover of the colours and colour sequence. Important for the subsequent fit of each ink is an indication of the picots at the edges of the printing-block. 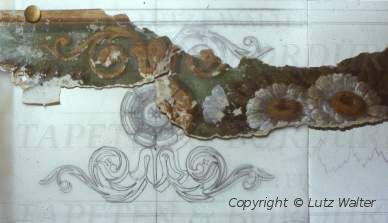 Wallpaper patterns, which have only been discovered showing an incomplete structure, must be re-drawn and reconstructed beforehand with the aid of similar examples and ornament collections. The finished drawings are embodied in the print-cutter and this then transfers them to previously-prepared wooden panels or rolls. To transfer the individual drawings onto flat print-blocks or pressure rollers, one uses so-called Kritzpapier (scratch paper). The engraved design of each printing colour, made with a steel needle, is transferred using black printing ink onto the wood surface. For better clarity when cutting, different colours are applied to the surfaces to be printed. 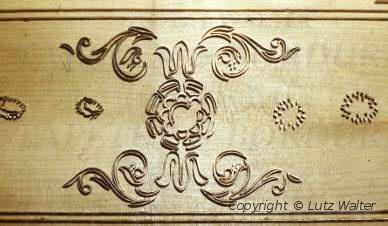 With a small metal cutting tool (chisel), one cuts out the outline of the pattern approximately 3 to 4 mm deep. The individual figures are then made from brass strips and drawn outlines of the design and are put into the previously-cut wood. To control the qualitly of the pattern and the match-up, a rubbing is made of each printing-block on tracing paper. After adjustment of the patterns, the metal-edged pressure surfaces are filled with felt, impregnated with shellac, and finally polished. For the block-prints only acid-free and age-resistant handmade papers are used, which are based on the colour, screen structure and surface characteristics of the findings. 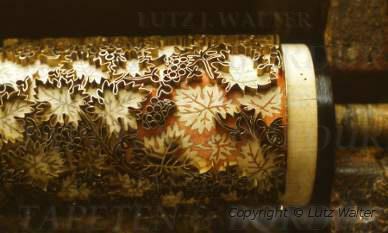 As with the originals of the 18th and early 19th century, sheets of handmade paper webs, which are glued together,are initially primed by hand. Satinization or other finishing effects ofthe basic colour is achieved by a special ink formulation and surface treatment. Printing is done with wood printing blocks, which assume the colour by gently tapping them onto the ink-impregnated cloth in the chassis, then transferring the design onto a roll of paper which is already rolled out on a printing table. 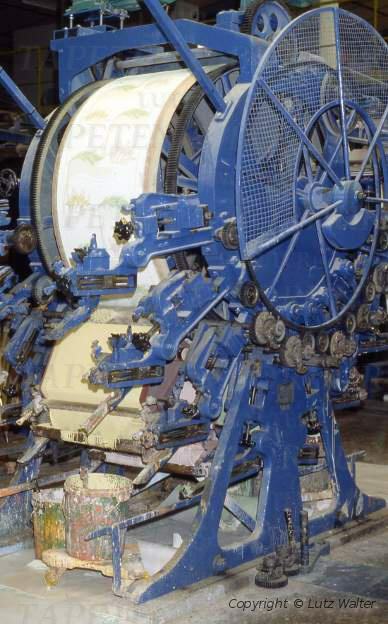 The Picot at the edges of the print-block allows precise positioning. With the help of a pressure lever, the print-block is then pressed onto the paper web. If pressure force, texture and composition of the ink are all in harmony with one another,then the result after lift-off of the block will be a clean print, characteristic of manual printing. Row after row is then printed on the entire wallpaper,sheet for sheet. After drying in the drying room, one proceeds then with printing the next colour using a new print-block until the design is complete. Mechanical roller printing is, like hand printing, a high-pressure technique. The technology has not changed since the mid-19th century. Printing is done using distemper (glue colours) on machines, which differ little in structure from the first glue-printing machines. The basic colour of the wallpaper is first applied on a brush-painting machine. After drying, the roll of paper which has been painted with the basic colour passes into the glue-print machine on a large cylinder, passing the individual colour apparatus-points, and is thus printed with each colour (wet in wet method) by the print drums (rollers) one after another.The printed wallpaper then goes into the dryer again and is then rolled up on a bale, in some cases it is given a special surface treatment such as Gaufrage or embossed, then it is cut and packaged on reels.